This ground floor apartment is part of a villa immersed in the silence of a beautiful landscape. The building is enclosed by one hectare of private Mediterranean scrub, with olive trees, pinewood and a small orchard. Its veranda looks out at the stunning view of mountains, high cliff coast and sea. With 5 minutes drive it is possible to reach one of the many well-known beaches of the area; with 15 minutes drive to reach the city of Alghero, its walled-in historical center and typical urban life. The apartment is fully renovated. It is furnished with antiques and handicraft objects patiently selected overtime. The inner division includes: a fully equipped kitchen, a large living room with fireplace, two comfortable bedrooms with double bed, two bathrooms with bathtub / shower and washing machine. It has satellite TV and Wi-Fi. It can comfortably accommodate 4 people with the availability of an additional bed for child. In the villa’s basement is a privately owned dwelling unit. The apartment is available for long-term rental throughout the autumn and winter. 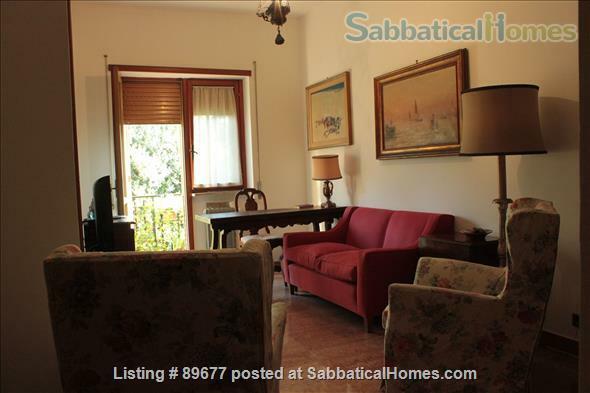 It is ideally suited to friends or couples that would like to have a comfortable base whilst exploring the island or taking part in language courses or even working in Sassari, Alghero or Bosa at one of the university faculties, or for those who have independent research projects and look for a quiet studio retreat. I am an Italian architect and scholar. After my first professional degree, I went to U.S. to continue my education in a different cultural environment. Since then I have been teaching Architectural Design Studio, History and Theory of Architecture for several North American and Italian Universities. I like to be with my American colleagues and to introduce them to the beauty of Rome.